These venison medallions might take a long time to marinate but are completely worth the wait. There is nothing better than the choicest slice of venison wrapped in bacon. Place chunks of venison into a shallow baking dish, and pour enough apple cider in to cover them. Cover, and refrigerate for two hours. Remove and pat dry. Discard apple cider and return venison to the dish. Pour barbeque sauce over the chunks, cover and refrigerate for two to three more hours. Preheat an outdoor grill for high heat. Charcoal is best, but if you must, use gas. Remove meat from the refrigerator and let stand for 30 minutes, or until no longer chilled. Wrap each chunk of venison in a slice of bacon, and secure with toothpicks. 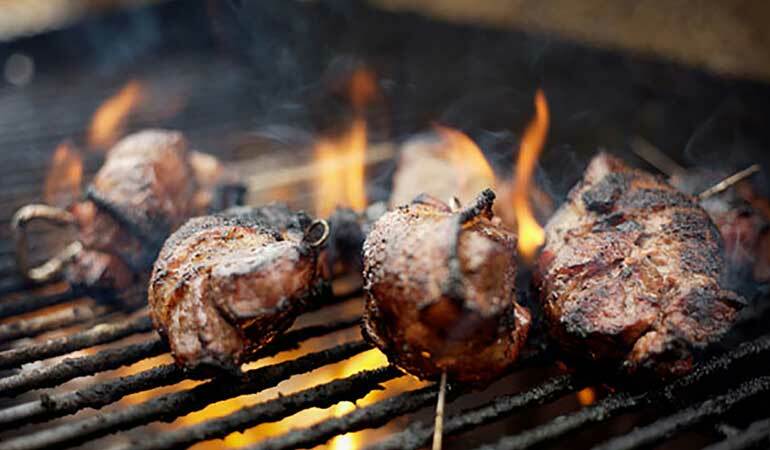 Brush the grill grate with olive oil when hot and place venison pieces on the grill so they are not touching. The bacon will kick up some flames, so be ready. Grill, turning occasionally, until the bacon becomes slightly burnt, 15 to 20 minutes. The slower the better. Dig in, and prepare to want more.